Slow smoked and roasted mutton shoulder meat breaded and deep fried. Served with a green herb chutney. Lamb lacks flavour taste more similar to confit lamb, but waitress ensured its only smoked. Smoked flavour was not coming through. When eating together with the sauce, the dish is balanced. Crispy fried Pakora we believe that used tempura flour to make it lighter. Squid is crispy yet tender. Samphire is almost dried as when it's fired for long it loses its moistness and remains the skin part. Onions are crispy and moist. Use of fresh mint and sliced red chilly is well-thought combo enhances the whole experience. One of the best pakora in London. Thought the dish comes as the whole fish head. Chef Neil confirmed they don't serve the whole head instead they slow braise and pull the meat. Make curry from stock with okra. The Thali plate is beautiful believe the make is Utopia . But the garnishes on thali doesn't add any value other than to bulk up the plate. Bread - Paratha which is cooked on the griddle is very nice. The dish has powerful dry fish smell which is bit off putting . We are so grateful and happy that Fine dining Indian is Recognised Worldwide for its Vision, Our readers are increasing day by day. we are incredibly thankful for Chef Srijith Manjunath mural, Ms Anjula Devi sharing her life success with Finediningindian. I would personally like to thank My wife Supriya premaraj, and all the esteemed personalities contributed to the magazine. We urge all Indian chefs around the globe to provide your recipes and articles for our future issues. We are also looking for promoters, through product placement advertisement. From September 1st onwadsMs. Supriya Premaraj will be looking after the Magazine and its editorial side. Vision : worlds best Fine dining indian Food magazine . which covers Indian chefs, Indian recipes, Indian women in food industry and many more great cause in relation with Indian food. 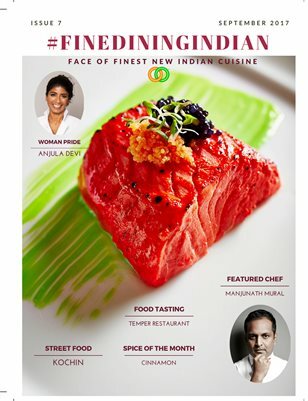 we are incredibly thankful for chef Manjunath mural, Ms Anjula Devi sharing her life success with Fine Dining Indian Food Magazine September Issue. Cinnamon is an evergreen tree of the laurel family, characterised by oval-shaped leaves, thick bark, and a berry fruit. When harvesting the spice, the bark and leaves are the primary parts of the plant used. Sri Lanka is the largest producer and cinnamon from Sri Lanka and Seychelles is considered the best in the world. Anjula, who started cooking with her father when she was 10 years old, runs her own Indian cookery school and catering business, both of which are dedicated to promoting and supplying authentic traditional Indian food in the UK. The chef, a proponent of traditional Indian cuisine, was raised in Southall and has her own product range Route 207, named in memory of the many trips taken with her father on the number 207 bus to Shepherd’s Bush market, to buy Indian spices, fresh fish and vegetables. Cochin also was known as Kochi is a major port city on the south-west coast of India by the Arabian Sea and the Laccadive Sea. Kochi is also known as the Queen of the Arabian Sea. It is part of the district of Ernakulam in the state of Kerala and often referred to as Ernakulam. Cochin is the commercial and industrial capital of Kerala and is the second largest city on the west coast of India. Cochin is proud of its world-class port and an international airport that link it to many major cities worldwide.